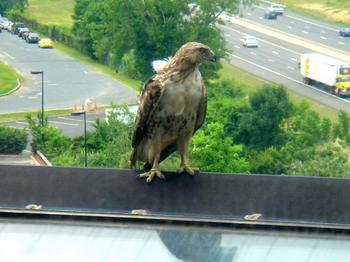 We were sit­ting at work, hav­ing lunch, when a hawk land­ed just out­side our win­dow. I half expect­ed him to have a mouse in his mouth, but no luck on that front. That’s my truck in the back­round!!! That use to be the win­dow I stared out of back when I worked there. A rad view of the Mass Pike (if such a thing were pos­si­ble).